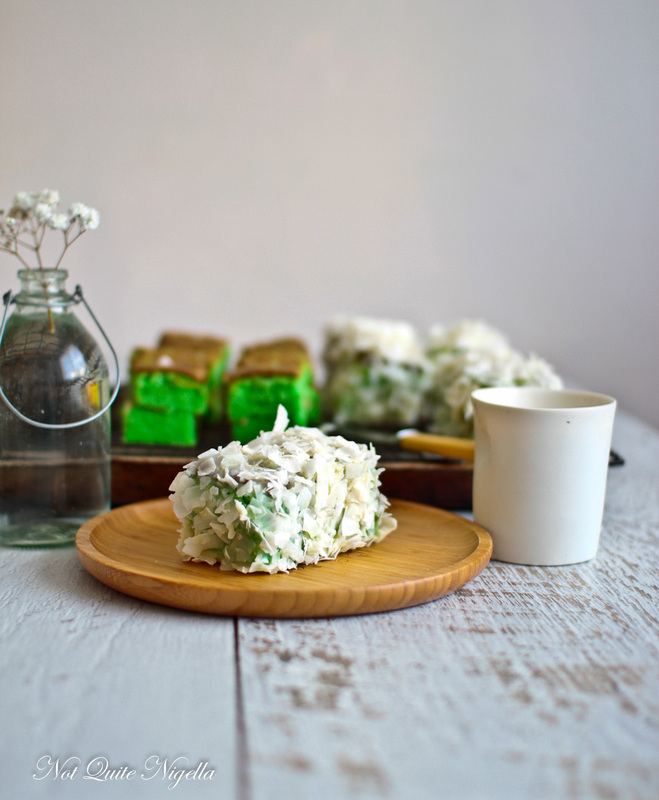 Pandan is one of those wonderful flavours and aromas that reminds me of Asia. Specifically holidays in Indonesia or family holidays in Singapore. 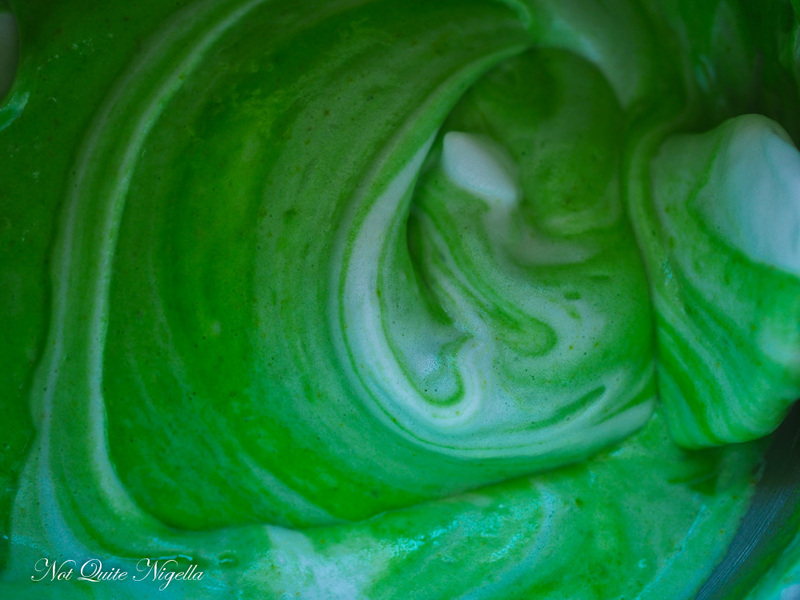 Pandan also colours foods bright green and is considered to be the Asian equivalent to vanilla. And you know a great way to eat it? In a lamington! This lamington is not the standard lamington cake recipe. Lamingtons are of course that Australian treat of cake rolled in chocolate sauce and then dipped in coconut. Jam or cream may be spread in between to make the cake a bit more moist. 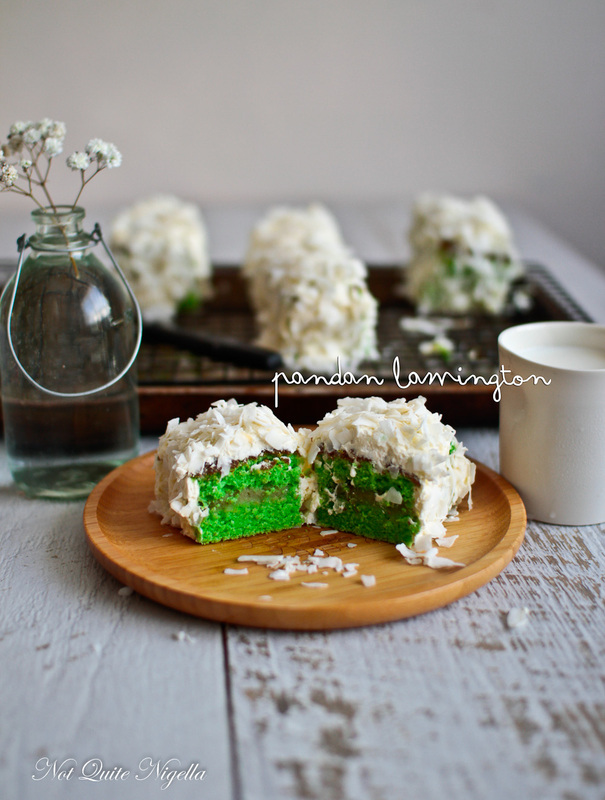 I have bad memories of dry lamingtons growing up and whenever I think of one I think of a dry, stale cake. I used a lighter cake here, a chiffon pandan, the same recipe as the pandan panda cake really. The cake is light, has great keeping power and I split it and filled it with kaya or coconut jam before dunking it in a white chocolate coconut ganache and then coconut flakes. I have used fresh pandan at times if I can get it at Paddy's Markets or I use pandan paste which is found in most Asian grocery stores, particularly in the Indonesian section. The last time I went to Paddy's during the week I was going to a meeting over yum cha. I'm a careful driver and I had someone closely tailing me waiting to get into the parking lot. I don't have very long arms (it comes with being short) and I had trouble getting the ticket and had to reach out and really grab for it. The driver behind me got so frustrated that he reversed with a screech and drove to the next ticket booth. I mean I took a total of 4 seconds more but he didn't want to wait. My boomgate opened the same time as his but he squealed ahead and parked his small beat up car very quickly and strolled off. I ended up walking a few metres behind him. "Oh god, imagine if this a$$ ends up being who I'm meeting with," I said to myself grimly. But he turned into a bank and I breathed a sigh of relief. I was early so I milled around the entrance of the yum cha restaurant and then I saw the long armed jerk walking towards the restaurant and go up the stairs. Looking at my phone I saw the time, it was time to go up and I went up the stairs and I overheard him mentioning the same person that I was meeting. So tell me Dear Reader, have you ever been in a situation like this? Do you have problems with reaching ticket machines? Do you like pandan? Buyer's tip: pandan paste and kaya jam are both easily available at Asian grocery stores. Step 1 - Preheat oven to 180C/350F and line the base only of a square 20x20cm/8x8inch tin (not a non stick one) with parchment. Beat egg whites and cream of tartar until soft and foamy. Add in the 80g/2.8ozs of caster sugar in a steady stream and whisk until firm and you can turn the bowl upside down without it moving. Scoop out and place in a large bowl. Then using the same bowl as the whites, whisk the yolks and 100g/3.5ozs of caster sugar until pale (2-3 minutes). 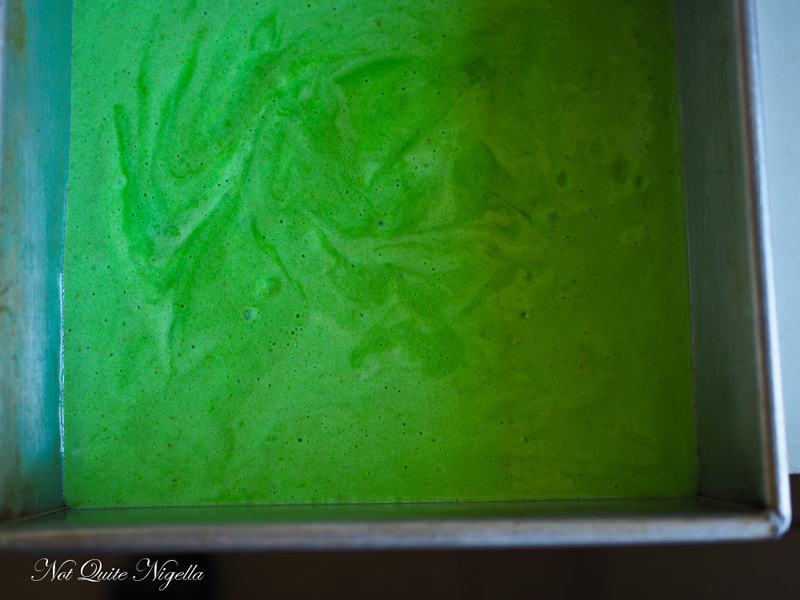 Whisk in oil until emulsified and then add coconut cream and pandan paste. Sieve in cake flour, baking powder and salt. Step 2 - Add the yolk mixture to the whites and fold in until streaks of white and green disappear and it becomes a uniform colour. Tap the tin gently on the bench to remove any large air bubbles. Bake for 30 minutes or until set. Once you take it out I like to run a butter knife around the edges to loosen. Allow to cool completely. You can do this the day before you want to serve them and wrap them in cling film when they are cool. Step 3 - Then trim the cake to remove the brown edges on the side and cut into squares or rectangles. Then slice each in half horizontally and fill with kaya (coconut jam). Spread a large plate with coconut flakes ready to roll the cake in. Step 4 - To make the ganache dip melt the chocolate and then stir in the coconut cream. Using two forks dip each cake in coating it on all sides. 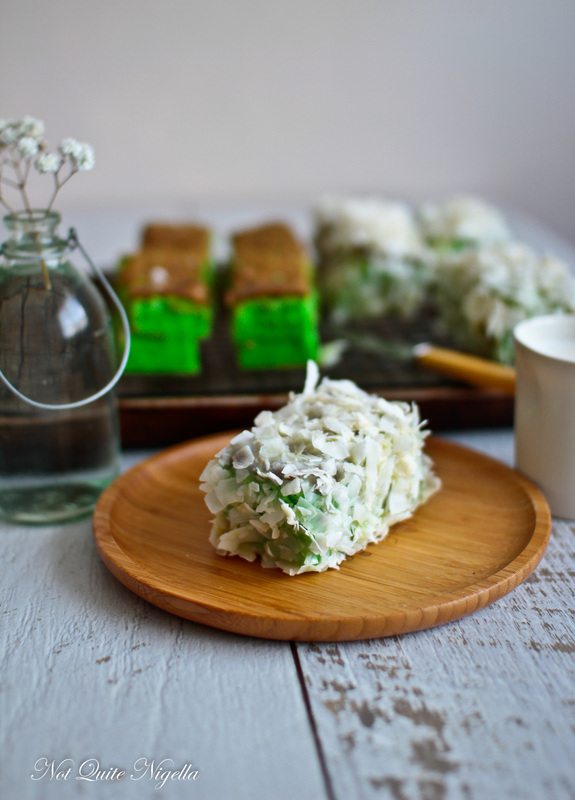 Place in the coconut flakes and coat on all sides. recipeMuscatels: Drying Fruit At Home! recipe Muscatels: Drying Fruit At Home!